Every organization has faced the complex issue of organizing its personnel to design new or changed services. How do we use our internal design engineers when they are interrupted by support tasks? Which contractors should we hire? How to involve the production staff that never has enough time or availability? Kanban points the way to resolve many of these thorny issues. 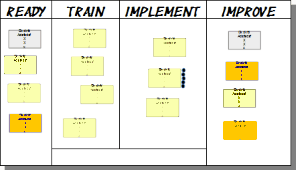 Cross-functional teams using Kanban may be the right solution for your organization.